So taken for granted, we hardly know it’s there, the body’s inhale and exhale from first breath to last. In tune with the heart’s beating, whose life breathes us here? Whose laughter, tears, shouts, whispers, night fears? Whose joys, whose sorrows shared? Breathes the hopes we hope for, the regrets we daily bear? Who is it in us suddenly appears? The breath summons itself in each to say. Demands we listen, hear. Bring close your ear. For J. Morris knows, and tells us where . . . Someone Is Breathing. Old School basslines roil the room. private soundtrack rattling in their earbuds. out onto the heads of helpless passersby? I hope so. I doubt it. Stereo. See note. don’t care what it makes me feel. For God’s sake, mean it! Be Old School, turn it up! drooling a little, certain of my thanks. 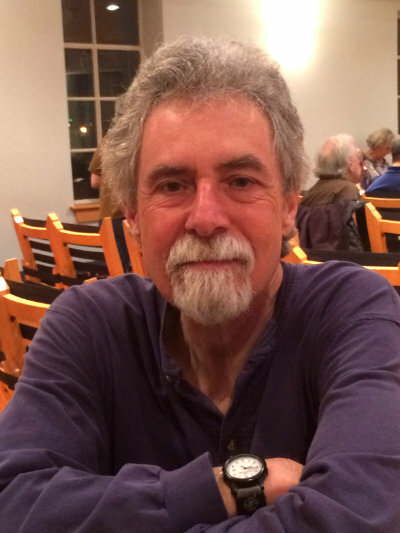 J. Morris has published fiction and poetry in more than 90 literary magazines in the U.S. and Great Britain, including The Southern Review, Missouri Review, Five Points, Prairie Schooner, Subtropics, Fulcrum, and Poetry East. A first-prize winner in the 2002 Big City Lit poetry contest, his work has been nominated for a Pushcart Prize and reprinted in Twentieth Century Literary Criticism and Anatomy of a Short Story (Continuum Press). His chapbook, The Musician, Approaching Sleep, appeared in 2006 from Dos Madres Press. A short story collection, When I Snap My Fingers You Will Remember Everything, was published by No Record Press in 2016. His musical project, Mulberry Coach, a collaboration with singer and lyricist Katie Fisher, released its seventh CD in 2017.